This is the cover of the journal I’ve just filled. I name my journals and I’d planned on calling this one “Rosie” because I started it at the same time my roses started blooming like mad in June. 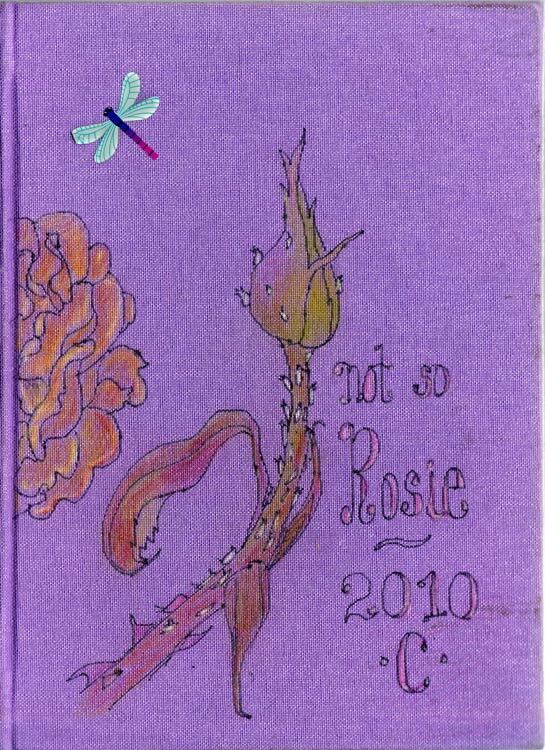 But given the struggles I’ve gone through, written about, and resolved in this journal, I named it “Not So Rosie” instead. If you wonder what those weird white bumps are on the rose bud, when I put the tiny rose bud under my magnifying lamp to draw it I discovered it was covered with aphids. Yick! I enjoyed drawing it anyway until I noticed an aphid jumping ship and landing on my drawing table. I declared the artwork and the journal done, dumped the roses and spent a little time admiring my newly bound journal (below), its blank pages full of promise. This is the fourth case-bound sewn-signature journal I’ve bound. With each one I’ve made fewer mistakes and learned more. I’ve continued to update my illustrated instruction sheet I wrote for myself, simplifying and correcting it. So many people have helped me that I wanted to share what I’ve learned in case it might help someone else. If you’d like a copy, it’s available to download on my website’s “Comments & Resources page. Meanwhile, my sketch kit has been shrinking. A friend brought back a tiny, $13 watercolor travel palette from a recent journey to Minnesota that included a stop at famous Wet Paint. I had to call them and order one for myself. The palette is 2 1/2″ x 3 1/2″ and has a ring on the bottom for easy holding. I found it a little hard to open and so super-glued 2 little wedge-shaped pieces of a rubber washer on the front edge of the lid and base which gives me a better grip to snap it open. Another customization suggested by Cathy was gluing an empty watercolor pan inside for holding water (sticking up on the right side). My favorite pens are (from the front) a Micron Pigma, a Lamy Safari fountain pen filled from a jar of Platinum Carbon ink (waterproof and safe for fountain pens), a Pitt Artist Brush Pen, a Papermate Titanium .07 pencil with F lead, and a Niji Waterbrush. 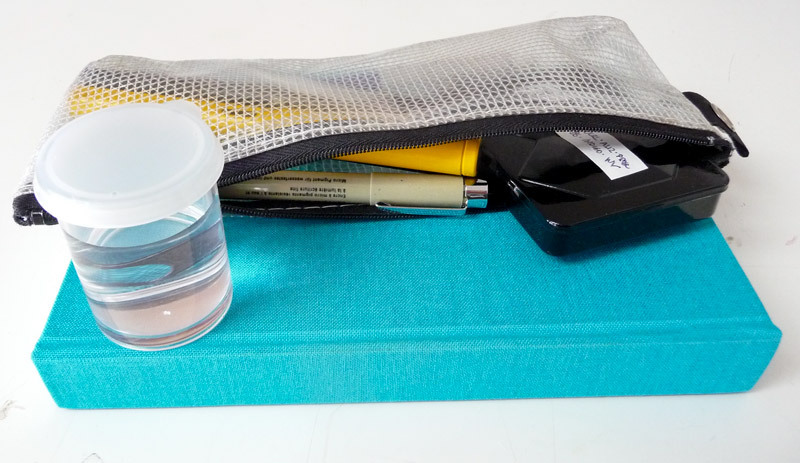 All of this fits nicely in a little zipper pencil case, including the palette. This little water container is surprisingly spill proof, and about the size and shape of a film canister. I can actually do just fine with the water in my water brush and/or the bottle of drinking water I carry around. The tape on top of the palette is a list of the pigments I’ve filled it this time. 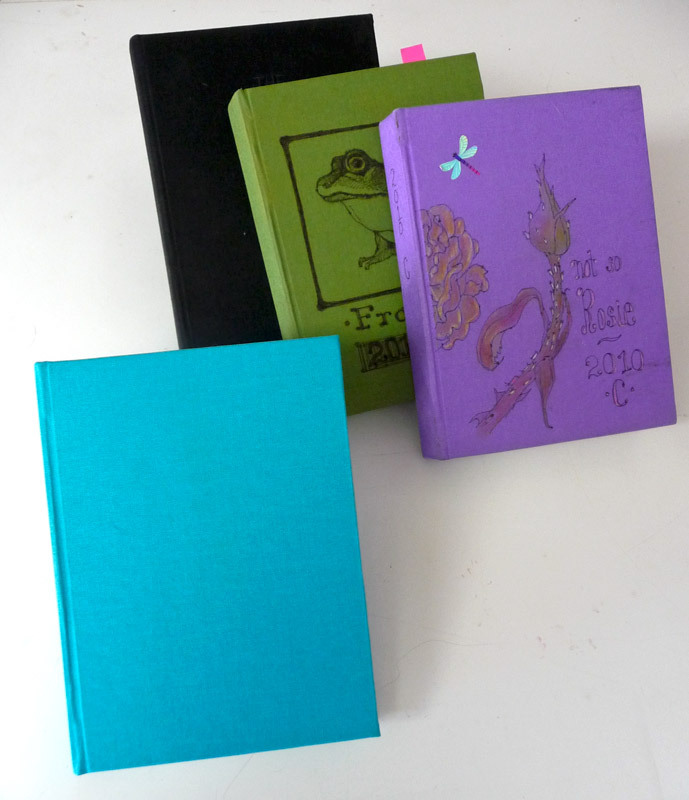 I’m so impressed with those journals. It’s such fun seeing what sketchers carry. I’ve pared down to sometime very like what you show and have the same plastic carrier. Love it! I carry my Daniel Smith paints in a cleaned out plastic eyeshadow compact that I found at the Dollar Store. Just wanted to say that your Wet Paint link is not to the wetpaintart.com site — it’s going somewhere else. Oh, sorry. I didn’t understand. Don’t worry about reading the bookbinding stuff if you’re not into doing bookbinding–it REALLY won’t make any sense in that case! I feel bad about posting that wrong link too. I went to the bad link and I think it’s just one one those “scraper” sites where they steal other people’s content and use the page to sell ads. Oh well. Thank you thank you thank you for providing that information on bookbinding. I have not tried a true casebound book before (with sewn tapes) but am very impressed with yours and eager to try it. Thanks for troubleshooting and providing these instructions. I love the stripped down travel kit, too. 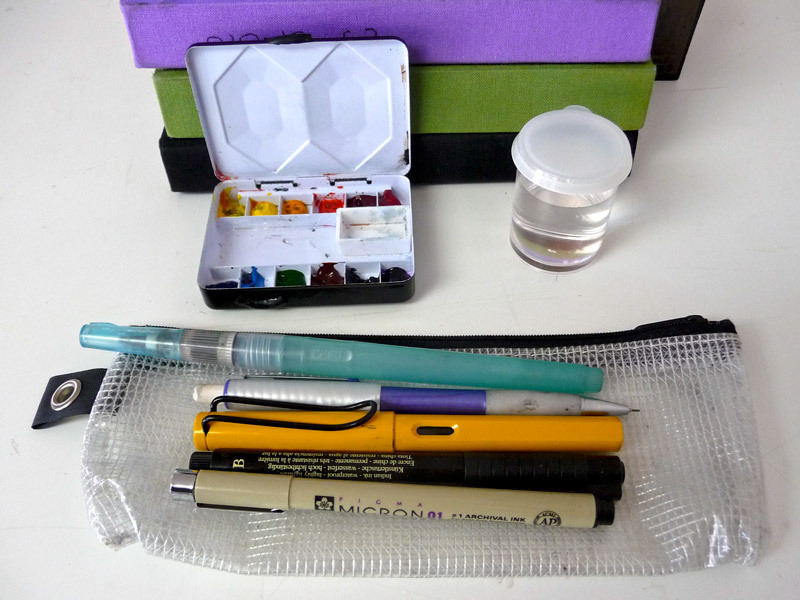 I have three of those tiny watercolor kits (I misunderstood that they had larger pans for paint) but will try adding that full pan for water….what a good idea! You continue to inspire me! Thanks for the info Jana! I’m so loving my new sketchbook! I think I’ll eventually get into making my own covers, but for now I’m just recycling old books that are the size I like! I had seen so many people doing this for so long and kept putting it off as it seemed so complicated. I didn’t realize I was missing out on so much fun! !